An innovative new system to stow seats within passenger train carriages to create space for cargo is now available for train operating companies to trial. It’s a unique approach, developed in collaboration with the UK rail sector and offers significant commercial, environmental and passenger benefits. 42 Technology has today announced the development of a complete seating system that will enable train operating companies – TOCs– for the first time to configure specific carriages to carry either passengers or high-value cargo as required. 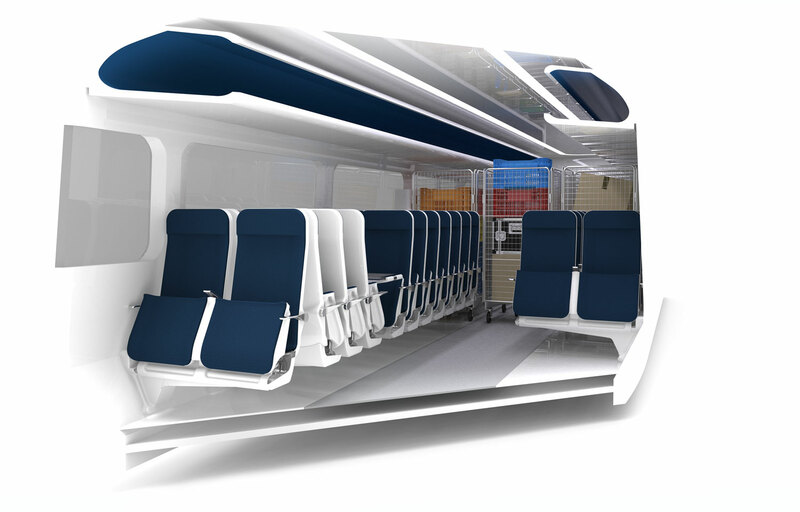 The Adaptable Carriage system allows the seats and tables within a passenger train carriage to be automatically stowed to create space for low density, high value packages and other cargo that would otherwise go by road. The system has been developed as part of a two year RSSB-funded programme, using extensive inputs from the UK rail industry, and when deployed could help ease road congestion, cut emissions and allow online retailers to offer later order cut-off times, faster deliveries and new services. The technology can be retrofitted into existing carriages or integrated into new build designs, and is now ready for use in its first industrial trials. 42 Technology has also developed a working demonstration module for its system that will be launched to the wider rail industry community at this year’s international Railtex exhibition – 9 to 11 May, NEC Birmingham. an innovative sliding mechanism to configure the seats into a seated position and to lock them in position along the carriage. The Adaptable Carriage technology is fully compatible with both steel-frame and modern aluminium train carriage designs using cantilevered seats. The seats have been designed to maximise passenger comfort and together with their associated mechanisms specifically engineered to add minimal extra weight to the carriage compared with existing industry-standard seats. 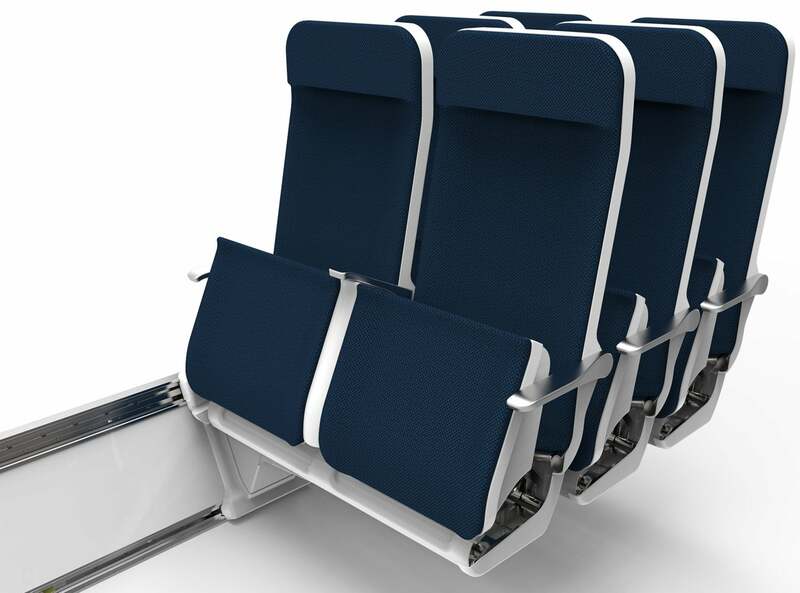 All the seats, tables and draught screens within each section of an Adaptable Carriage are connected together and can be moved along the length of the carriage via a system that also acts to cover the working mechanism in passenger configuration. The control system ensures that all seats are safely secured in both the passenger and cargo-carrying configurations, and it can be readily integrated with the carriage control system to automate door locking ensuring complete passenger safety. The reconfiguration process is fully automated, takes under three minutes to complete and as a result the 20 rows of seats in a typical passenger carriage (with four seats per row) can be compressed to create cargo space equivalent to the capacity of an articulated lorry. Adaptable Carriage is an example of what can be achieved when the UK rail industry partners with a cross-sector innovation consultancy to deliver solutions to specific rail challenges. The Adaptable Carriage system has been developed and demonstrated to give train operators, logistics companies, and other potential system users the opportunity to see the technology in action. It offers a novel but very practical way to get more cargo onto the rail network and to help TOCs secure additional revenues from their existing infrastructure that could be invested in improved facilities and services for passengers or offset against ticket price increases. 42 Technology is already working with a number of interested parties to support initial trials of Adaptable Carriage and to enable further commercial development of the technology.